software development and operations. The teams offer expertise in all aspects and stages of the service-delivery lifecycle. Members are typically experienced, skilled and highly paid people with broad knowledge in software development, network management, operating systems, integration and other aspects of development and operations. ���They pool their tremendous experience to figure out why one application is slower than its predecessor,��� says EMA���s Craig, ���or the root cause of a problem.��� Assembling these teams can be expensive. 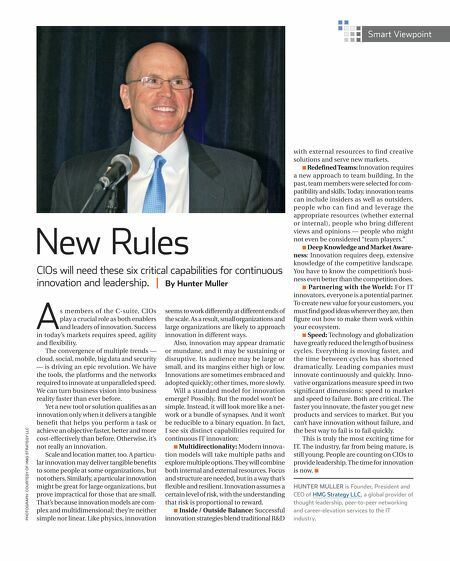 Members need to be ���Renaissance men and women,��� says Dugger, people he says have ���expertise in 30 years of legacy mainframes, distributed systems, external services and all the other complex elements driving the average enterprise infrastructure.��� Until recently, many of the testing issues had been solved jointly by developers and QA teams, creating what is called ���stub��� software. These programs mimic the activity of services with which a typical application interacts. ���We see lots of clients building lots of these manual workarounds,��� says Gilliland of Accenture. ���Unfortunately, over the past few years, they���ve found them increasingly numerous, costly and difficult to maintain.��� A more recent breakthrough tool for DevOps is service virtualization. It provides a single platform for building an entire virtual test environment. Such an environment can simulate all dependencies and other aspects of the actual production environment needed for software testing. Service virtualization can also help eliminate the disconnect between development and operations, while speeding software development and deployment times. 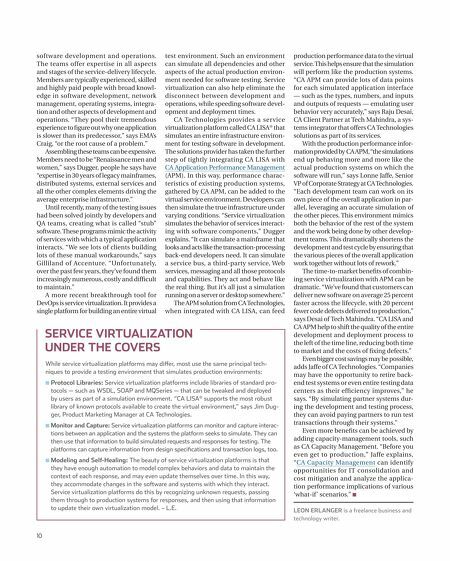 CA Technologies provides a service virtualization platform called CA LISA�� that simulates an entire infrastructure environment for testing software in development. The solutions provider has taken the further step of tightly integrating CA LISA with CA Application Performance Management (APM). In this way, performance characteristics of existing production systems, gathered by CA APM, can be added to the virtual service environment. Developers can then simulate the true infrastructure under varying conditions. ���Service virtualization simulates the behavior of services interacting with software components,��� Dugger explains. ���It can simulate a mainframe that looks and acts like the transaction-processing back-end developers need. It can simulate a service bus, a third-party service, Web services, messaging and all those protocols and capabilities. They act and behave like the real thing. But it���s all just a simulation running on a server or desktop somewhere.��� The APM solution from CA Technologies, when integrated with CA LISA, can feed Service Virtualization Under the Covers While service virtualization platforms may differ, most use the same principal techniques to provide a testing environment that simulates production environments: n P rotocol Libraries: Service virtualization platforms include libraries of standard protocols ��� such as WSDL, SOAP and MQSeries ��� that can be tweaked and deployed by users as part of a simulation environment. ���CA LISA�� supports the most robust library of known protocols available to create the virtual environment,��� says Jim Dugger, Product Marketing Manager at CA Technologies. n onitor and Capture: Service virtualization platforms can monitor and capture interacM tions between an application and the systems the platform seeks to simulate. They can then use that information to build simulated requests and responses for testing. The platforms can capture information from design specifications and transaction logs, too. n 10 M odeling and Self-Healing: The beauty of service virtualization platforms is that they have enough automation to model complex behaviors and data to maintain the context of each response, and may even update themselves over time. In this way, they accommodate changes in the software and systems with which they interact. Service virtualization platforms do this by recognizing unknown requests, passing them through to production systems for responses, and then using that information to update their own virtualization model. ��� L.E. production performance data to the virtual service. This helps ensure that the simulation will perform like the production systems. ���CA APM can provide lots of data points for each simulated application interface ��� such as the types, numbers, and inputs and outputs of requests ��� emulating user behavior very accurately,��� says Raju Desai, CA Client Partner at Tech Mahindra, a systems integrator that offers CA Technologies solutions as part of its services. With the production performance infor���� ma��tion provided by CA APM, ���the simulations end up behaving more and more like the actual production systems on which the software will run,��� says Lonne Jaffe, Senior VP of Corporate Strategy at CA Technologies. ���Each development team can work on its own piece of the overall application in parallel, leveraging an accurate simulation of the other pieces. This environment mimics both the behavior of the rest of the system and the work being done by other development teams. This dramatically shortens the development and test cycle by ensuring that the various pieces of the overall application work together without lots of rework.��� The time-to-market benefits of combining service virtualization with APM can be dramatic. ���We���ve found that customers can deliver new software on average 25 percent faster across the lifecycle, with 20 percent fewer code defects delivered to production,��� says Desai of Tech Mahindra. ���CA LISA and CA APM help to shift the quality of the entire development and deployment process to the left of the time line, reducing both time to market and the costs of fixing defects.��� Even bigger cost savings may be possible, adds Jaffe of CA Technologies. ���Companies may have the opportunity to retire backend test systems or even entire testing data centers as their efficiency improves,��� he says. ���By simulating partner systems during the development and testing process, they can avoid paying partners to run test transactions through their systems.��� Even more benefits can be achieved by adding capacity-management tools, such as CA Capacity Management. ���Before you even get to production,��� Jaffe explains, ���CA Capacity Management can identify opportunities for IT consolidation and cost mitigation and analyze the application performance implications of various ���what-if��� scenarios.��� n Leon Erlanger is a freelance business and technology writer.